Today a hundred military honours and awards have been announced today, mostly relating to the war in Afghanistan. The British military Great War was, of course, vastly larger than it is today. Around a million men served in the army, navy and air force from London alone. How many honours and awards did they receive? There is no way of knowing exactly how many Londoners were given awards for gallantry or good work during the war. They probably numbered somewhere in the tens of thousands, though. Among the 10,142 London County Council employees who served, 401 were awarded British decorations: including 5 Distinguished Service Orders, 68 Military Crosses (of whom 7 earned bars for a second medal and one a second bar for a third MC award), 39 Distinguished Conduct Medals (2 bars) and 125 Military Medals (10 bars). Twenty-six earned CBEs, OBEs or MBEs, and ten earned Royal Red Cross medals. 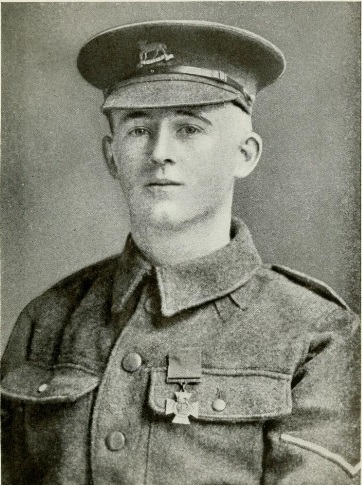 In addition to those British awards, 21 received French decorations, nine the Belgian Croix de Guerre, and another 16 earned other foreign decorations. If that figure is scaled up to the (roughly) one million Londoners who served*, we can conservatively say that tens of thousands of Londoners earned medals for gallantry and good service, possibly around 40,000. Soldiers in the 47th (2nd London) Division alone earned two Victoria Crosses (Sgt J Harvey, 22nd Londons, and L/Cpl LJ Keyworth, 24th Londons), as well as at least 97 Distinguished Service Orders, 472 MCs, 321 DCMs, and 1909 MMs (including bars). A total of well over 2,500 for this one division, primarily made up of Londoners; as it was inherently a fighting force we can’t scale this up to the whole of London. Rev Noel Mellish and Cpl George Jarratt, who each won the Victoria Cross; cricketer Reggie Schwarz who earned the MC as a staff officer; Albert Mason, the brave MM winner who was blinded in action; FP Hewkley, the gallant signaller who also earned the MM; the Hanscombe brothers Bert and and Richard who earned the MM and DCM respectively; Harry O’Hara who earned the MM as a soldier and then became a fighter pilot; Sergeant-pilot CRL Falcy who earned the DCM for bravery in the air; 2 Lt IL Roy and Arthur Newland, who earned the DFC and DCM respectively as air aces, JH Dollittle who earned the DCM for bravery on the ground; and Arthur Feldwick who earned the Albert Medal for saving lives. As today, it was not only men who earned medals during the Great War, of course, and we have also met ambulance drivers Mary Bushby Stubbs and Sadie Bonnell, munitions worker Hannah Spash, and nurse Beatrice Alice Allsop who all earned medals for their bravery. In 1914-1918, as now, there is a story and a person behind every one of those awards. The men and women given honours and awards today deserve our respect, as does the memory of those who were decorated for their service in the Great War. *One million is the rough estimate for those who served from Greater London given by Adrian Gregory in Capital Cities at War (by Jay Winter, et al), it is also roughly the figure I estimate from the number of naval and military absent voters in 1918 in Greater London increased in proportion with ratio of absent voters and service personnel nationwide. Under the threat of attack from the air, some of the treasures of London were hidden from view behind sandbags. At the British Museum, those artifacts that could not be moved to safety after the galleries were closed to the public were protected, as we have seen. At Charing Cross, the statue of Charles I was hidden behind wooden hoardings and sandbags. 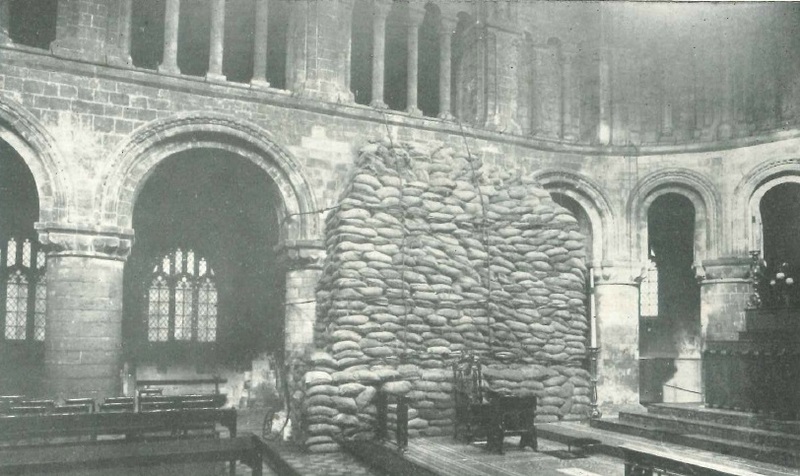 At St Bartholomew’s Church in Smithfield, the tomb of the church’s founder Rahere was also covered with sandbags. Unlike most London landmarks, though, St Bart’s really did come close to destruction. On 8 September 1915, the largest bomb yet dropped on London fell from Zeppelin L13 on Batholomew’s Close. The 660lb bomb caused an enormous amount of damage, creating a hole eight feet deep, gutting a local printworks, smashing shopfronts and shattering windows. A fountain in the close was virtually split in two. One curious effect of the blast was that it revealed the timber-framed gateway to the courtyard of St Bart’s church. Thankfully it missed the nearby hospital and the soldiers being treated there. Rahere founded the church and hospital in the early twelfth century after a vision of St Bartholomew instructed him to. The site was on the King’s land, so Rahere had to win the favour of King Henry I, which he managed to do despite being discouraged by the London barons. Rahere was often portrayed as the king’s jester or minstrel in later years, but remained prior of St Bartholomew’s until his death. 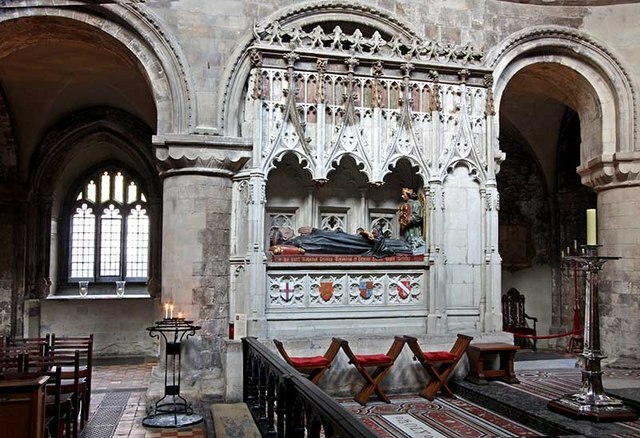 His effigy was installed in the church in the early fifteenth century, where it has remained to this day – despite the danger of time, the puritans, and two world wars. There are a number of plays that we associate with the Great War, R.C. Sheriff’s ‘Journey’s End’ and Joan Littlewood’s ‘Oh! What a Lovely War’ the most prominent among them. For Londoners during the war, though, the theatre was a place of distraction and escape. The most successful West End play of the war was Oscar Asche’s musical comedy ‘Chu Chin Chow’. In the days before radio and television, the theatre, cinema and music halls were the big mass entertainments available to Britons. Throughout the Great War, despite the scorn of the ‘Die Hards’ who wanted all amusement abandoned for the duration, all three flourished. We have seen that the film the Battle of the Somme was a huge success for a few weeks in 1916, but really most audiences wanted escapism and follow-up documentaries about the war did not have anything like the same level of success. Charlie Chaplin was a much more popular choice among British cinema-goers. The theatre, too, was a place of refuge. Diaries and letters of Londoners and people visiting the city include numerous mentions. ‘The Man who Stayed at Home’ stood out to Macdonagh because it was the only war play on offer at the theatres he passed, walking through the West End in 1916. One play stands out beyond all others as the great hit of the war years, and it is the play mentioned in both Brittain’s and Macdonagh’s lists of plays in London. This was Chu Chin Chow, a music comedy written, produced and directed by Oscar Asche. The play was, according to William A Everett (writing about its obvious Orientalist elements), ‘one of the greatest successes in the history of popular musical theatre’. It opened in August 1916 and ran for nearly five years – until July 1921 – with 2,235 performances, more than twice as many as any other previous musical. This made it the longest-running play ever in the West End (although it is no longer in the top 10). It went on to be a hit on Broadway and was revived in 1940. The play is loosely based on the tale of Ali Baba and the forty thieves, featuring slaves, spies, lovers, disguises and a magic cave. The Guide to Musical Theatre has a fun synopsis here. As Macdonagh’s description of the theatre crowd and Edward Brittain’s whirl-wind leave schedule suggest, it was not just civilians who sought escape in the theatre. 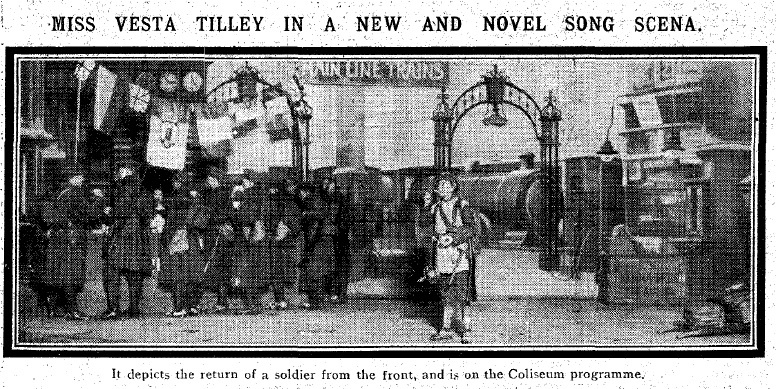 Many soldiers – and particularly officers – went to the theatre if they could. They also took the theatre to war with them. In the Imperial War Musuem’s collection is an HMV record of the songs from Chu Chin Chow, taken to war by 2nd Lieutenant C.R. Tobbitt of the Royal Engineers. 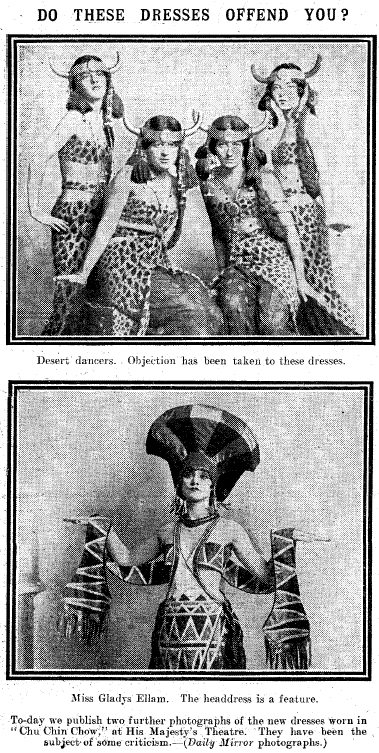 Although one suspects that the appeal of watching a bunch of comrades performing the play was rather different to seeing Asche’s young actresses in their risque outfits. Theatre, like cinema and music-hall, offered civilians and service personnel alike an escape from the pressures, dangers and anxieties of wartime. Chu Chin Chow was great escapism for wartime (and post-war) Londoners, combining this relief from the anxieties of everyday life with a glimpse of (a version of) the orient and with music, comedy and colourful costumes. It was just what people needed in the hard years from the summer of 1916.